Galigeo's enterprise-wide solution, based on ArcGIS, helps Carrefour manage 10,000 stores worldwide. Redlands, California—Esri announces that Carrefour Group, the second-largest retailer in the world with nearly 10,000 stores around the globe, has implemented an enterprise-wide marketing solution from Esri partner Galigeo. 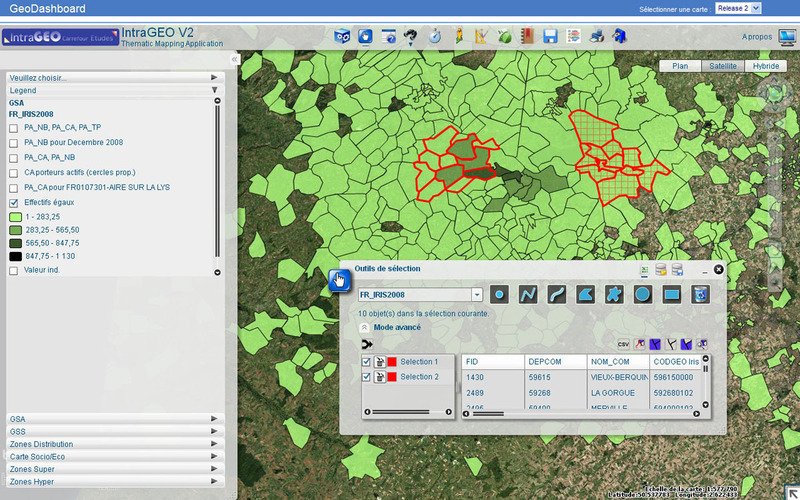 The solution, Geodashboard, incorporates ArcGIS and enhances existing enterprise business intelligence (BI) software to improve decision making. Carrefour staff around the world are guided through different operational workflows including retail site selection and competition analysis. The solution improves their expansion and development strategy, optimizes direct marketing activities, and enhances store performance through a better understanding of sales territories and customer needs. "Carrefour Group selected Galigeo, an Esri partner, because of its ease of implementation and its ability to meet technical requirements of Carrefour's data centers," says Francis Rivière, geomarketing manager at Carrefour Group. By representing and displaying data on interactive maps, Galigeo's geomarketing application identifies hidden trends that are not discernible in tables, charts, or other dashboard widgets traditionally used in business intelligence solutions. "We're excited to support Carrefour with a very innovative location intelligence solution focused to help Carrefour meet its strategic challenges and help the company achieve its growth agenda," says Christian Tapia, Galigeo CEO. "Galigeo is transforming the way companies implement marketing and sales performance applications within BI and other enterprise systems," says Simon Thompson, Esri director of commercial solutions. "Location analytics is enabling a more refined and deeper understanding of how to improve marketing and other store-level operations. It enriches data for a more intimate understanding of customer relationships, behavior, and needs." Learn more by visiting esri.com/retail or visiting Esri booth #933 at the International Council of Shopping Centers (ICSC) RECon trade show, to be held in Las Vegas, Nevada, May 19–22, 2013. Galigeo provides innovative location intelligence solutions for superior business analytics. Galigeo software connects directly to enterprise applications, maps large-scale datasets and applies spatial processing to enhance data visualization, reporting and predictive analytics. Our solutions are focused on improving business outcomes. Galigeo customers use the solution to improve Sales Territory Management, Trade Areas Analysis and Resource Allocation, among the many other use cases. Galigeo is trusted by some of the world's largest companies and governmental organizations. For more information about Galigeo, please visit www.galigeo.com.